The attendees of the outreach activity hosted by the Sanctions Monitoring Board (SMB). The Malta Bankers’ Association (MBA) recently attended an outreach activity hosted by the Sanctions Monitoring Board (SMB). 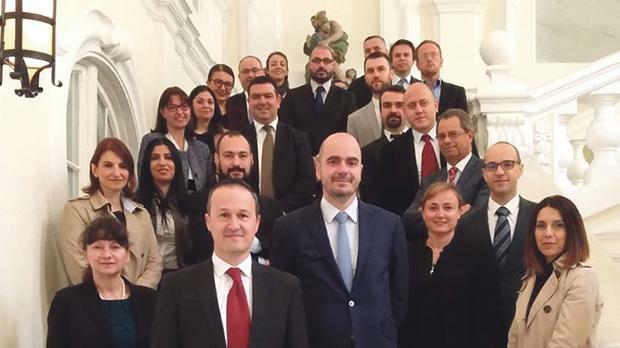 This event, which was held at the Ministry for Foreign Affairs in Valletta, forms part of a series of events which the SMB is organising in order to ensure ongoing dialogue with credit institutions. These activities will aid in strengthening the cooperation between both the SMB and the member banks of the MBA in their efforts to eradicate money laundering, combat the financing of terrorism, and rigorously implement national and international sanctions law. The MBA was represented at this event by its assistant secretary general, Mariosa Vella Cardona while Neville Aquilina (chairman, SMB), Mariella Grech (secretary, SMB) and George Grech (First Secretary) addressed MBA members.